MAGAnomics baby!! Throw dem ju-ju bones out the windows and hold on to your britches… The U.S. Dept of Labor is reporting unemployment claims have dropped to 210,000. That’s the lowest jobless number since December 6th, 1969. That’s right. We better grab chin straps for the hard hats, because pay raises and wage rate increases are thundering toward the middle-class like an unstoppable herd of buffalo. Exactly on schedule. Cha-ching & Ka-pow. This has been the plan within very-stable-genius Trump’s MAGAnomics all along. Take-home paychecks are already seeing the benefits of lower tax rates for the middle-class. The mid-size employers are simultaneously benefiting from lower corporate tax rates. This means the employers can afford to pay more…. and right on cue, the labor market says ‘show me the money‘. We timed this out to appear in Quarter #2 2018: More take-home pay, PLUS a pay raise, EQUALS the ability to afford slightly higher consumer prices (Q4) on durables. See how that works? The January 2018 jobs report showed a gain of 200,000 U.S. jobs, and more importantly, a 2.9% year-over-year growth in wages. –SOURCE– [Biggest wage rate jump since the phoney trillion stimulus-funded growth mid-2009.] We continue to remind of our two-year prediction that stunning wage growth will evidence in Q2 of 2018 (April-July)… these wage and labor reports preview that wage growth cycle. The Main Street economic engine is fundamentally detached from the drivers of the Wall Street economic engine (monetary policy). While the paper wizards are getting kicked in the teeth, interest rate increases will not diminish Main Street gains because wage increases will remain ahead of price inflation. Interest rate increases will, however, impact Wall Street because interest rates are monetary policy, and a great deal of Wall Street is based on speculation within the paper (false) economy. Can you see now why we have been saying for two years MAGAnomics will draw out the new dimension in modern economics? There is a distance between Main Street’s economic engine and Wall Street’s economic engine. MAGAnomics operates in the space between them. The stock market retracts today against fears of: tariffs + inflation = rising interest rates. Pffffttt… Many on Wall Street have not recognized that monetary policy will not influence Main Street growth until interest rates, and/or inflation, surpasses the rate of wage growth. The parity within that dynamic is still about a year-and-a-half away. If you pay attention, the economic engine disconnect is visible. Note the market schizophrenia. February 2018 wage growth will exceed January (driven in part by new tax rates); March will exceed February; April will exceed March…. and so on, and so on, (remember these are year-over-year comparatives). This is the EXACT reversal of prior economic policies from several administrations that were killing Main Street. At the very heart of America-First, MAGAnomics focuses on U.S. jobs and U.S. companies. Investment growth drives labor demand; labor demand drives wage rates; wage rate growth increases consumer demand for goods and services; that demand drives investment; more investment is expansion of production capacity – ie. need more labor. There will be natural price inflation to come as an outcome of Main Street’s economy expanding. However, two factors: #1) inflation will creep slow, there’s a natural lag and built in downward price pressure within the gap of unfilled production capacity; #2) Most importantly growth in wages will exceed the inflation rate -for approximately two years- thereby making increases in product costs irrelevant to consumer demands. Inside this mix, off-shore manufacturers will continue trying to get their products into the hands of Americans who have more disposable income. That unique aspect will continue to keep prices down during the phase of shifts from import manufacturing to domestic manufacturing. Unfortunately, imports might keep GDP growth rates down – but the underlying economy will be expanding as domestic production begins to replace imports. Ongoing financial results will be solid for companies doing business in the U.S., and actual profit results will gain market weight over speculation. The Titans are rising. Economic nationalism is winning…. globalism is losing…. multinationals are shrieking… paper weasels are crying…. Middle Class American workers are CHEERING! This entry was posted in Big Government, Big Stupid Government, China, Decepticons, Deep State, Dem Hypocrisy, Donald Trump, Economy, Election 2018, Election 2020, energy, Environmentalism, EPA, media bias, President Trump, Trade Deal, Uncategorized, US Treasury, USA. Bookmark the permalink. Help me understand how we shift from a “service economy” to a “production economy” with rising wages and interest rates without popping the massive global credit bubble, raising the bond vigilanties from the dead, and experiencing a hard economic landing. This should NOT be read as a dissent of your analysis nor opposition to what Trump is doing. It’s not. I am missing something. Please clue me in! Rising wages will generate more revenue and if the US will stop borrowing bind prices will go up and intrest rate will go down. In other words, real GDP growth vs. phony borrowing our way to “prosperity” with more and more “quantitative easing”? Right? And real stock market growth of real “producing” companies. Almost all of FBN have been talking about this since the big stock market drop in Jan. Markets became addicted to the printed money (ie, phony growth). The stock market models are going threw withdrawal symptoms. Trillions of foreign dollars are pouring into the USA as it is the ONLY country in the world that still has a growing market and a stable government. Europe will not see market growth again in our lifetime. The demographics do no support it. And Chinese money is getting the Cofefe out of Dodge trying to get to the USA before the Chinese economy hits the wall. There will be no shortage of dollars to support the economy. Simple answer, we just start producing maximumly again, and tax any country who tries to import anything in. Especially if they are using government subsidies to under cut the US prices. Perhaps you are missing the HUGE welfare drain on US citizen “producers”! Especially the many foreign mercenary enemy invaders! Welfare is fine for Religious organizations, and to be supported as ‘can be’ by producers! For the US government such is never constitutional. :Produce or die! There is a difference between a drop in stock prices and economic drop for those who don’t own equities. Stock prices have always been volatile. We need to pop the credit bubble. Otherwise the landing will just be harder. The credit bubble will deflate slowly if interest rates rise gradually, as fewer people will be able to make the payment. OTOH more people will avoid default because of increased wages and lower food/fuel prices. If Trump would put a usury tax on the banks such that credit card loan shark interest rates would be lower, that would be a good thing too. Ditto with the tuition bubble – the free money ie student loans need to be cut way back so universities cannot continue raising tuition thru the roof, and might actually need to cut fat and lower tuition. With the need for skilled tradespeople, fewer people should be applying for a useless college degree and many universities will be hard hit. Trump would assure his place on Mt Rushmore if he’d apply the Sherman Act against the medical industry and pop THAT massive bubble pronto. Talk about an immediate HUGE wage increase for every single worker in the US, and a lot of individuals too, who pay outrageous premiums to insurance companies for ridiculous medical expenditures. Maybe the strong economic news will help the big ugly restart. Restart? It is still going strong. Lol, i was going to say, RE start. I missed the start. Did somone go to jail??? Watch. this post is the first step in a “Six degrees to AG Sessions”. Anyone else notice how the bogus inflation number crunchers panicked when they heard about the wage increases? Clearly stagnant wages were the plan all along to keep bogus inflation numbers close to zero. Or stated another way, stagnate wages was a deliberate plan, despite their misguided invocation of minimum wage changes for burger flippers since those would not affect the CPI. Yeah, I picked up on that one too. Almost like it was planned. Still convinced the bogus 5.4% number from the Atlanta Fed is what caused the freak out in the market, 10K point swing, and back to normal again. Someone made a LOT of money. The recent sell off is not worrying me. Too many millennials on Wall who don’t have experience with a normal economy. We saw a nice rebound from the Atlanta Federal Reserve today because of the Manufacturing Data that was released. You’ve got such a great handle on all of this, and your insight? Well, let’s just say it blows me away. So happy you’re on our side and explaining the way for us. I actually look for your posts under these kind of articles because I know it will either reinforce what I just learned in the article, or it will give me something new all together, but of the same subject. When I was younger I used to wish my mind was analytical and could think like you guys. It was never meant to be, and trust me, I’m alright with that. What makes me happy is I’m finally getting it, I’m slowly understanding the concepts and that is so much further than I’ve ever been before. These subjects would put me to sleep or my eyes would just glaze over, but no more. I have you, Sundance, Secretary of Commerce Wilbur Ross and Mulvaney. You guys rock. Yes, there are some other brilliant minds here, and I appreciate their insight as well, it’s just you guys explain it better for me. And you know how I know when I’ve got it? When I can repeat it to my husband or daughter without cheating. So thank you Fleporeblog and all the rest who contribute by sharing links along with your insight. You’re making so many of us smarter along the way. The mere fact you put me on that list with the others is absolutely amazing 😉! I was an accountant major and a math teacher for three years. Now I am a Data Manager within the NYC DOE. Not only do I have to analyze the data and prepare it for schools, I have to be able to get them to understand it and act on it. That’s a great skill set, Flep. I second Mai’ingankwe, happy you’re on our side, and so dang prolific! Fle, I connected your education profession and economics insight with Navarro’s education (UC Irvine) and his economics advisory position to PDJT and figured you might be working with Navarro. RED thanks for the laugh. It would be a dream come though to work with those Killers! Fle, after what maiin said I just had to pile on. What is true is how you add to the conversation and inparticular on the economic front. My wife has followed Navarro for years and was not surprised when he was picked as an advisor to PDJT. Gotta finf some preseason Yankee tickets now, here in Tampa for some time now. They couldn’t have picked a better person to help others understand and act on the data you present them. You just have a way that makes it easier for us thicker in the heads to comprehend, which isn’t always easy I’m sure. It’s a talent, and I’m sure your three years of teaching is helping you Bigly whether it’s conscious or not. I’m happy they found you and I’m happy we’ve got you. Have a fabulous weekend and stay smiling! I have stopped following those people. Their estimates seem to be quite different than the actual prints. Just the CofC model that we have been living with really since NAFTA, so how has that worked out. McDonald’s has installed the “order your own” kiosk in a town near me. It takes a few minutes to figure it all out and they have assistants to help you NOW….but, it feel so unfriendly. They do bring your food to your table. The bottom line is this, does it save any money and will it be improved? Well their demographic is the under 30 crowd, so they should have no problem with technology, I am sure McD will also put out an App to do the same off your phone. I loved Quarter Pounders but have not be able to successfully digest one for a couple of decades. I prefer the technology to order with or self check-outs, especially since my blood pressure maxes out when am forced to deal with a order taker / cashier that has an IQ of less than my hat size, since my shoe size would give them too much credit. It will save boat loads of money in the long term, especially in places that have an artificial minimum wage that is 10-15+ dollars per hour has been imposed. They will probably cut at least 2 shifts of 3 people and still have personnel available to deliver to the table. That will equate to 300 dollar savings a day minimum based on a 5 hour shift part time workers, that is more that 100,000 a year…that is a lot of burgers to sell to pay for them. Trump has done way more for America & Americans in just his first year then other presidents have for decades. He has a business mind which is what has been needed. That is the one think I can believe. DJT runs US as USA.inc. Every decision is based on profit/loss for USA benefit. If it is not beneficial to USA then it won’t be done. Fox Business News was barely able to find someone to analyze today’s announcement in a positive way. The stock market takes a dive when Pres. Trump speaks, on rumors, on Mueller rumors, etc. I’m becoming more convinced that these computer bots set off some of these rapid declines. Maybe it’s based on how much air time Pres. Trump gets per day. Today was a good day for working Americans…That and unemployment compensation is way down & wages are up. It rocks!! Jan-wages are up I agree, but with the drop from 35 to 21 for corporate taxes I have yet to see any drop in their consumer prices. I have noticed a lot of prices rising, however. Since 1969? Wow the hippie days, and we are lower than that in unemployment in today’s world? That is not because of Obama, that I can tell you. The 1969 wartime employment days when unemployable youth had run to Canada. Yeah, and then they all begged to come back. Nixon pardoned them, if I remember correctly. I thought it was Carter that pardoned them. “The stock market retracts today against fears of: tariffs + inflation = rising interest rates. Yes, I think so too, Sundance. I think that the Fed will raise interest rates in Baby Steps. And I don’t think it will start doing it this year. It’s the only thing that makes sense, because anything more than that would have a negative effect. On the local side, a friend at the gym today (who works at a bank) told me that the CD rates have started going up again. Hate to be a curmudgeon… Whats to stop the Feds from raising rates. I am not saying the assertions raised by MAGA economics analysis, ie MainStreet vs Wallsheet, are not valid. If the analysis is correct, monetary policy of past three decades was design to benifit the paper economy over the real capacity of manufacturing…aka MainStreet economy. Then the 800lb gorilla in the room becomes, if the past policy was designed to rake over the coals the middle class. What is stop them from F’ing MAGA economic policy by simply have the ecomnists(academics) that comprise and formulate measures of monetary policy to come up numbers that send inflation soaring. It is like if they where screwing over the middle class in the past to advance the globalist paper economy, what is stop this proven trend of screwing the middle class from continuing on the up trend of MAGA by artificially raising rates. Economics is not a HARD science much of it is based on SOCIAL science aka ACADEMIC THEORIES. And their are plenty of them beholden to the globalist elite that would love to say, “We told you so!! !” Specifically if theor end game is for the globalist elite to wash their hands of the middle class and pawn us off onto the nanny state of big government. What’s to stop Pres Trump from…Auditing the Fed. Our President is not without a few arrows in his quiver too. The same economists that argued the Nation can afford running a huge monetary deficit year after year ARE the same ecomonists that where all doom and gloom on Greece having a 100 billion debt. Go figure, and as sure as the day is long and the sun rises in the East, their argument boiled down to this, ” Greece’s debt had become 100% GNP hence the doom and gloom. But the USA debt, naw we are at only 40%(2010), we can afford to borrow. Now, who benefited from all hot air gibberish. The PAPERSTREET benefited. Guess what, at 20+ trillion(nearing 100% GNP) and no end insight on more deficit spending means the USA economy must grow to 50+ trillion in GNP terms just to send the ratio of DEBT/GND back down into the 50% percentile. That is marco economics at work. Just like in the private sector, govt debt is issued on a balance sheet of total assets versus liabilities. You mention Greece, which has very few assets other than its GDP. The US Govt, on the other hand, has vast land, mineral and property holdings, which offset it’s liabilities. I’m not sure what the total worth is of the US Govt…but I have read estimates of around 800 trillion. Other estimates put into the quadrillions. Economists like to use GDP in their debt equations, but GDP is basically just ‘cash flow’. The US Govt has more than just cash flow. It has tangible assets that are the envy of every other country on the planet. It’s probably a good thing that we don’t talk about what the Total Worth is of the US Govt Holdings, because this would give the weasels in congress more ideas about putting us in even more debt. I think that Pres Trump and his band of wolverines will be good stewards of our country’s assets…and in the long run, will start getting us out of debt. He knows that you have to spend money to make money. And right now, we are in the ‘spend money’ phase. @MTK I just posted a long response to you but it went missing into the ether. Maybe becaise I used the word ba$tards. Hope one of the kind mods retrieve it. “And I don’t think it will start doing it this year. Negative to a whole list of deplorable interests, that is for sure. But, the saying goes “One man’s misery is another’s opportunity”. You cracked me up with that! It’s not a big story because reverse discrimination has been the way to go for 40 years or so. Even a putzhead like Schumer can get away with it. Okay…what can be done by these people…Schumer. The mayor of Oakland, etc. surely there is some form of consequences…or it will continue, if not grow. Tucker did a segment on this story…and totally shredded Schumer for it. If he said it on the floor of Congress he’s protected. Can’t prosecuted a Congress Critter for anything said on the Floor of the House or Senate. I live in a rural area of Ca where construction has been dead for nine years. As a general contractor…nothing other than small jobs. Beans and rice times. Went into a small local market today and saw some tradesmen …buying cold packs of beer and t bone steaks. Im glad you saw that. Im in charge of everything at home. Ive seen 10-15% on average price increases with exceptions as high as 45% across retail and services and restaurants. My husband hasnt gotten a raise in 2 years. Seeing as how CA is dead last in US news report on quality of life, I can only assume this economic engine is only a trickle here due to our state representation at local and federal levels. As an ex-CA small business and starting a new business from the ground up in NC seventeen years ago my cost of doing business is still lower now than it was in CA in the mid nineties. So why would anyone start a business there. others stand and fight for what was taken away from them. My family goes back to the 1800’s in Ca. California will always be under attack for its natural resources, climate, and beauty. I have been self employed for most of my life and know what hard times are as well as good times!!! Ten years of bad times is in the past. Let the good times roll, build the wall and stop voter fraud. I moved from Santa Barbara to rural San Diego Co. six months ago. Moonbeams fuel tax was not good but he will be gone soon and hopefully this wonderful state will wake up soon. I doubt many here remember the 50’s and early 60’s, but it would be nice if you could experience something similar. I hope we are on that course, thanks to Donald J. Trump. Americans want what you stated back! These percentages tell the RINOs, CoC, Globalist etc. to go take a 💩. In a Morning Consult poll, 59 percent of Americans say it is “important” that President Trump place tariffs on imported steel and aluminum, specifically from China, showing a wide range of support for the White House’s economic nationalist agenda. About 66 percent of voters said shrinking America’s more than $375 billion trade deficit with China was key, as well as 56 percent who said they wanted to see the Trump administration challenge China’s leaders on intellectual property protection, and 44 percent who said they want China labeled as a currency manipulator. The drum we need to hammer is QUALITY over PRICE. I’m tired of my dockers wearing out in a year, my thin-fabric blue jeans getting holes in the knees, my dress shirts stitching fraying. I don’t want a $200 TV with bad audio and dying pixels. Refrigerators with burned out logic boards (I’m looking at you LG). As I say at work, It’s time we return to classic “environmentalism”, as in products that work for 20 years and don’t have to get trashed, cars that owners can repair, get out of this planned obsolescence model we are all stuck in. I want so save the planet because it helps my wallet, not so some socialist can get a gov handout. Really the price of an item is NOT cheaper when it does not last. Say you find a refrigerator for $600.00 because it is foreign made. But you have service calls and then you have to replace it in a couple years, say two …another $600.00 + 200.00 spent in service calls, and that is if you buy the same trashy appliance. Thats $1400.00 for four years + another $200.00 in service calls. Do it all again and in two more years that’s $2400.00. On refrigerators and maintenance in just 6 years. Buy a good USA made refrigerator to start with, made with US steel/metal and pay double, $1200 instead of $600.00. No troubles in the same 6 years and you saved yourself $1200.00 and aggravation too. Smart money goes for quality goods made from quality materials. Have had to replace two different wall ovens in the last 10 years. off. The new one takes 15 minutes to reach 400 degress. Progress. has it’s 50s style wall oven. Told me that they wanted to update. still get parts for it. I buy USED appliances. My washer and dryer, bought used have lasted 24 years so far with no problems and my oven was came new with the house 24 years ago. We replaced the bought used freezer and frig with new two years ago since hubby insisted. We will see if they make it the 22 years the old ones did. G., I have a Montgomery Ward Freezer Model 8954.00 my parents bought 9/26/1974. They purchased a 2 year ‘At Home Service Warranty’ that expired 9/26/1976. My dad passed away in December 2000 and mom passed away in January 2011. That Freezer is in my garage STILL RUNNING! Will be 45 years in September. My repair guy who tried over and over to fix my American made wall oven told me the new energy star standards are the culprit because they have parts that break. I am not technical enough to remember the details, but try to find an old used wall oven. Baseball, hot dogs, apple pie, and Chevrolet!! Oh yes, I remember them well! ⭐️ The kids were safe to wander the neighborhood, hitchhike or go trick-or-treating. ⭐️ If you wanted to work you let the town know and you were in business. — No business licenses needed except for a very few businesses. ⭐️ The town doctor and dentist took care of the poor families gratis. — No Obummercare needed. ⭐️ The churches saw to it that the poor families had food and clothing and the kids got work. The men in town made sure the drunken husband was made aware that if he lifted a hand to his kids or wife THEY would deliver justice. Vagrants were rounded up and were either sent to the state mental institution if it was obvious they were nuts or to the country home if they had no home. Mom volunteered there and taught art. Other ladies (and men) also volunteered and taught various skills. — No welfare needed. ⭐️ If a house burned down, people pitched in and saw to it the house got rebuilt and furnished. ⭐️ During hunting season, the entire town shutdown as the men went hunting to stock the larder for the winter and the women were busy canning what the children picked from the gardens and orchards. ⭐️ Swear words??? What were those? They were NEVER used around the women and children. If they showed up on a building they were immediately scrubbed off or painted over. ⭐️ No store was open on Sunday and everyone went to church. That is a fingernail sketch of my life in upstate New York in the 1950s. The life the Milner Round Tables such as the Council on Economic Development and the Council on Foreign Relations worked hard to destroy. That is what I was referring to. Thanks for painting the picture. Yes, those were my youth years. I was born in 1955. We had safe, vibrant communities where all were respected except the town drunk, everyone who was able had a job, the neighborhoods were “policed” by always-observant tattletale stay-at-home moms and enforced by dads, life was affordable for families, kids played outside all weekend and all summer long, mothers and fathers fixed everything in the house and garage, schools actually disciplined and educated, repairs were infrequent, and clothes didn’t wear out, they were handed down to the next child. There were no snowflakes raised in my day. Your feelings got ignored or hurt all day long. Whiners were not tolerated. I want that life back for my grandkids. Where do we look to get a pertinent comparison of this statistic before and after LBJ’s Great Society legislation? Factors have been manipulated so often to serve propaganda purposes that I fear we are looking at apples and oranges. I need fuel to confront my socialist acquaintances. One thing most folks miss on these tariffs being imposed is….. IT”S TAX MONEY! It goes right into the federal tax stream! I’m ok with China paying some of my tax bill! China has 50 ghost cities that have almost no one living in them. They look like modern US cities. The reason they build them is to make sure that their population are constantly working so that they don’t return back to the fields and will eventually rise up against the government. Our President is an EXTREMELY smart man and knows that the US Government will make out BIGLY on those taxes. MORE American companies deploying their capital to generate MORE profits in a MORE business friendly tax and regulatory environment and MORE employees employed and paying taxes = MORE tax revenue – less Welfare expenditures + tax revenue from tariffs = Lower Deficits! WINNING BIGLY! True about China: this is why “Xi” is trying to become dictator for life, and clamp down on the nascent freedoms tasted by the Chinese in the last years. However, China is NOT a free country by any means, and Xi means to bring back the oppression of the Mao days to solidify his hold. This depends on a Chinese culture of obedience and group-think, and on idiots like Jackie Chan, who apparently has brain damage from too many head shots, saying that democracy and freedom are not necessarily for China. Xi obviously thinks a Putinesque kleptocracy will work in China. We shall see: perhaps a majority of Chinese do long for the privations and mass exterminations of Mao, and find the freedoms of the last years unsettling. Freedom can be scary for the weak-willed and those fearful of competition and failure. And do the younger generations remember or know anything about Tiananmen Square? The tighter the fist around people becomes, the more they ooze out between the fingers. Xi needs to remember that, or he’ll have to have mass exterminations like in the early 60s. I’m holding off on judgement of Xi and what he might do and why he was given so much power and authority. The Chinese are very good at learning lessons. Going back to the Tiananmen Sq days is out of the question IMHO. Look at Singapore. They are essentially the old Chinese Malays who kept out of the clutches of Malaysia, kept their British Civic ways but are a very authoritarian society. The people want this authority and thrive in it. There is NO corruption in Singapore. China’s biggest problem is corruption. Can you imagine running a country with so many regions, cantons, towns and villages with so much corruption? Look at the corruption in US politics since the Clinton 90s. It is almost impossible to decipher and control. Now multiply that 1000 times and you have China. Xi knows that for China to become and stay a superpower, he must play by international rules as far as human rights is concerned. He knows it’s the only way to keep growing the economy. But eradicating endemic corruption is a different story. US or Australia style long drawn out investigations, court cases etc would never ever work and will be too costly. But a President with “hang ’em high” powers can get the job done. It would take only a few to be jailed or executed (without the due process we’re used to) for the many others to cease their corruption or retire away. Just remember, most of the corruption is by senior party members. Going after them without the power would only result in Xi being ousted. Now he can go after them without that fear. Dictatorships are – ipso facto -much more efficient than quarrelsome democracies: this is one reason why the brutal slave-state of Sparta defeated the democracy of Athens (although slavery also existed in Athens, just not at the same violent level). Yes, if Xi follows the Singapore model, rather than the Mao model, and promotes Chinese nationalism over Socialism, then America may find itself in trouble on various fronts. Stalin learned that lesson the hard way: when the slogans in the early 1940’s were “Fight for Communism” the Russians retreated a thousand miles. When the slogans changed to “Save Mother Russia” the Russians finally stood their ground. Before the fateful year of 1913 when we got saddled with the Fed, a federal tax and the states LOST their representation in DC, Tariffs funded the US government instead of the Feds printed on demand fiat bank script. 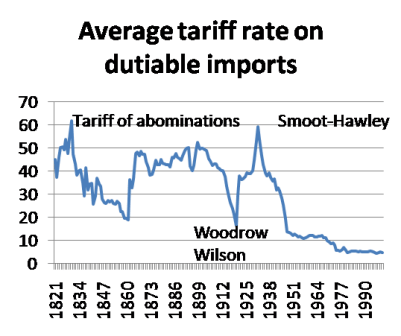 Remember imported goods were LUXURY GOODS and the tariffs were mainly paid by the rich, not the middle class and poor. Are we still going off the changes made to UE that does not count those who have dropped out of the work force? The same manipulated system? Are these true numbers? Same crook system, but the resultant data is apples to apples so it gives an indication of the direction unemployment is going even if it doesn’t tell you the true state of unemployment. I use ShadowStats (“John Williams’ Shadow Government Statistics”) for a better look at what is happening. Williams is NOT happy with the US economy/defict and where it is headed. Unfortunately President Trump has to fight his OWN party as well as the DemonRats, all of who are in the pay of the Globalists who WANT THE USA (and us) DEAD. Typo in first paragraph. Should say 1969. Unless you’re a globalist who wants really cheap labor and damn the working conditions. No. It means at the very near future, many skilled workers trying to escape the rot of the EU (and Canada) will come to the US to work and fill the vacancies. Good for business. And if the economy slows or stalls, you kick ’em out. The biggest deal with the job creation driven wage growth is that as domestic production increases, consumption will finally deliver more bang to the GDP buck because the consumption will go to domestic goods instead of imports. Imports are a necessity but when they exceed exports they are a negative to growth. We saw this in the 4th qtr of 2017. Consumption was booming but it went to buying exports. As Trump rejiggers the trade imbalance through tariffs and trade renegotiations, consumption will increasingly drive GDP growth higher and we will begin to see 3%, 4%and even 5% economic growth that can’t be denied. Trump knows there will be initial shocks to the stock market because of his trade policies but so long as unemployment is going down, wages are going up, and consumption is increasing, the fundamentals will begin to overcome all market jitters about a trade war. 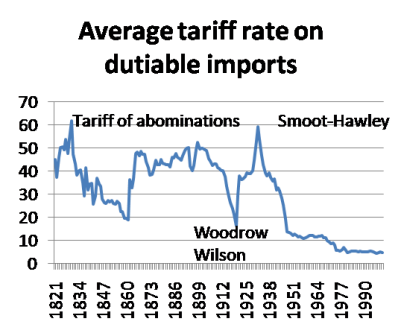 Right now, the balance of trade is so slanted against the US that no country really has the credibility to exact any more economic pain to the US in terms of tariffs, etc than they are already doing right now. Trump is indeed playing in the leeway space that is in this current state of trade imbalance. I think he can afford to begin to close those trade deficits for some time until other nations regain some leverage to fight back. In the meanwhile, there’s enough “slack” in the imbalances that they will permit these trade encroachments by Trump. Can anyone say MAGA?? Employment number out tomorrow morning. Drones are cheaper, but then … China does have harsh penalties for any infractions. Like you, I would like to take a sky tour of the false fronts and props, just like Horrywood back wots. Thank you for the short clip. To me, that’s just scary looking and unsettling. I wonder how many people they can fit in all of those skyscrapers and the empty houses surrounding on the outside? I wonder how much money they’ve invested into all of this building as well. China has got to be spending an unprecedented amount of money. They’ve really hit overdrive when it comes to their military spending and weapons as well. It’s crazy, especially when we won’t be paying for the bulk of it years down the road from our unfair trade deficits. They’re going to have to find new markets and expand on those they have to make up for the hundreds of billions in loss to the U.S. otherwise, they will never fill those ghost towns. I really don’t think they will anyways, but what do I know about the Chinese government? Far less than many. What I do know is it takes a heck of a man to go toe-to-toe with Xi. I don’t see a panda when I look at him, I see a dragon and always have, even when our President’s granddaughter sang to him and his wife. I saw a dragon with a family, but still a dragon. When I read articles like this from Sundance, it hits me more and more how lucky we all are as Americans and in so many different ways. President Trump loves all of us and when he speaks with Xi, he’s right in his element. He loves the game and what winning entails. He’s simply amazing. There are not many men in our country who has his heart and can do what he does. So yes, we’re darn lucky and so far ahead of the game with him in the lead. He loves to win and he’s passing that on to all of us, especially our children who are watching and listening. Our generation Z. The millenials will never know what hits them. Our President Trump was right, so much winning! And no, not tired of it, not even a smidgen. Their plan to fill those high rises is to force 250 million people from the countryside into the cities. Once they become city dwellers they’ll have to buy things from stores and do e-commerce, driving up domestic consumption. They also figured that if they just copied foreign cities like New York City (Tianjin) that they could replicate those economies domestically. “Nearly a year ago, I visited a replica of New York City under construction outside the Northern Chinese city of Tianjin. Workers were constructing dozens of skyscrapers on a piece of swampland inside a bend in the river, giving it an uncanny resemblance to the island of Manhattan. There were plans for a Lincoln Center, a Rockefeller center, and much more. US wages are slowly beginning to tick up as the labor market tightens and it is even reported people are feeling good enough to actually starting to leave jobs in an attempt to upgrade their positions. Yet, this is the part of the “Tax Cuts” that is unreported and/or unreported. Skilled jobs are actually being created or are returning to US shores. A primary cause of the so called wage gap was created by the devastation of middleclass skilled and blue collar jobs, which actually eliminated large numbers of high salary positions and flattened pay increases that balanced the upper class wealth. The logical extension of this phenomenon is the increasing industrial protections to encourage the return of more skilled and blue collar jobs to the US. Yes, the US consumer will be asked to pay more but it is time for the consumer to choose between Cheaper foreign products or a return of actual skilled labor and chance at a real future for US citizens. Finally for the globalists and the Libertarian utopians, there are current NO Free and Open Markets. It has been economic warfare for the past 30-50 years and the US is finally attempting to enter the battle. April 1st, we’re getting a $1.10/hr raise at my company. Darn that Trump–it’s all his fault I’m gonna have more money in my pocket!! The stock market is sky high, way too late for many small potatoes like me, with no where else to have a place to make money .. I ,and millions just like me, are sitting on our money in a safe place. Once the interest rates begin to filter down into bank savings accounts and higher C.D rates kick in … we won’t have so much to fear living longer and depending on top ramen/rice/and beans so much. Interest rates are going up. Savings will be great again. in Iran home, held there for 444 days! He, like Trump, turned The Media inside out crazy! And We, as a nation, had our first taste of Real Leadership for the first time ever! And we rejoiced in our wonderful President, Reagan. I had finally made a large amount of money in 1999 stock market. But put most of it in savings, because I knew to not risk anymore at that time. It did nothing but sit there as I dwindled it away. In the 80’s you could live off interest rates from a million, easily. Is that so hard to understand? It’s basic common f***ing sense! Do believe this is the reason for all the chaos about Russia & all the mass shootings. The Democrats are terrified that their voters are going to take the leap of faith and start believing in America greatness again. If that happens the party is finished. Nunes is tired of playing around. The Big Ugly is inbound, over the targets in 5 – 4 – 3 – 2… They’ll never know what hit ’em, all the way up the ladder. The mighty are fixin’ to fall! Concur…Nunes is done playing around. I have a complaint about this so-called MAGA campaign!!! During the past year I have noticed that there is MUCH MORE road construction and MUCH MORE commuter and shopping traffic on the roads!!! It now takes me almost 15 minutes to get to my office instead of 10 or 12!! I want to go back to the former normal economy with hardly anybody doing anything. Ahh, 1969, a great year for me! Came home from Vietnam in May, married my sweetheart who waited for me in June, Nixon gave me an early out from the service in December and I found my dream job on the ground floor of the computer industry which enabled me to provide for my family for the next 40 years! I pray that these Trump years will provide that opportunity to this generation! And I feel like it will. All this plus more, but our GDP just 2.5%? Energy independence will also contribute to keeping inflation at bay as well as reducing our debt. This is bigger than 1969. 210,000 is a hard number. Remember, in 1969 the norm was mothers stayed home and the fathers were in the work force. You probably have double the number of people in the work force today. so 210,000 is really low. Not to mention a large part of the work force was in Vietnam. So 210000 is low. I’ll tell you what makes me nervous: Amazon’s PE flirting around 326! What the hey? How much commerce does it gobble up before the government calls it Too Big To Tolerate? Don’t we have laws addressing this? Amazon is pretty hot. I actually like it. I know, everyone says leave them, but they always treat me like gold, and never push their politics off, in their videos, nor their sales products. Everyone is allowed their opinion, and Amazon has never infringed upon mine, even if they are flaming liberals. I leave total right wing conservative reviews for their Amazon movies, and they always show them. Often on the top. It will take a double plus Amazon to bring that one down. No comment on the dissappointing and low 2017 Q4 GDP rate? It has been addressed several times. Read the comments just above you. They should try living on the average retirement income….even a week would have them shitting their pants. One more thing to remember. The US is now the #1 producer of oil in the world. That is the same as free money being pumped into the economy, kind of like money growing on trees. It is literally sucking money out of the ground and spraying it into the American economy. That is not to mention that it keeps the cost of domestic energy moderated while at the same time keeping us free from foreign energy blackmail. anyone have an estimate on when we see a impact from new Domestic Manufacturing? I expect new factories will have to be built from scratch? I figure 2 years. Maybe faster because of less regulations now. Build, baby, Build! My DH & I work in Detroit. People are able-bodied but not working because they receive “benefits” and are not counted in the unemployment data. Most of the people are on “SSI” Supplemental Security Income”. And their children also receive SS benefits. This is a FEDERAL program (part of social security) with receipients receiving an additional supplement from the state. This is in addition to welfare and/or WIC. Social programs are big $$$$. I work in the medical field—& the people on SSI claim they have back pain, fibromyalgia, headaches or depression and they are unable to work. It galls me putting in a labor epidural in a 20 year old Mom on her 5th kid with her 5th baby daddy—all of her kids get SS benefits and WIC/SNAP, she’s in SSI, and in MI the poor have their heat paid for in winter. So this lady has a head full of braids with a fancy smart phone, clicking away with her acrylic nails and bossing me around when she’s only dilated to 1 cm. Yes, clearly obvious why she’s unable to work. TL/DR: true unemployment numbers do not reflect those who are no longer looking for work and are receiving other benefits. We are involved with other small businesses and often did children’s entertainment for fairs and festivals. Many of the artisans, like the guy I bought my handmade harp from, said they can not afford to compete with the welfare payments. Why would an unwed mother collecting for her kids AND her sister’s/cousins kids** want to bother trying to get a job? ** In Boston MA area the social worker can not do ‘surprise inspections’ and instead has to make an appointment to see the ‘client’ This allows time for the boy friend to move out and the additional kids to move in. A buddy rented the other side of his duplex to such a woman. She collected on four extra kids and the boy friend had a full time job. You want to really cut the defict?? Insurance companies catch scammers all the time IF it costs them money, it is time the US government did the same. Fraud is another area the Department of Justice is tackling. A few other interesting cases. AG Sessions,the “Silent Executioner,” is not known for tipping his hand too early, HOWEVER he has sent 250 feebs, 31 ATF agents, 8 US Marshalls plus U.S. Attorney Benjamin Greenberg and three Assistant US Attorneys to look into the Broward County school shooting. I do not think all that man power is looking at an already caught crazy kid…. President Trump knows how to get the most out of his magic wand. Obama just didn’t know anything about anything.